My scholarly interests are in the philosophy and history of science, and the relationship between gospel and secular truth. In 2003 I graduated from the BYU psychology Theory and Philosophy doctoral program. While in the Theory and Philosophy program I developed an interest in how science is done (research design and data analysis), the implications of scientific assumptions, the truth claims that science is capable of making, and the relationship between the gospel and scientific discovery. Currently I am a clinical research statistician for Intermountain Healthcare and an adjunct psychology instructor at the BYU Salt Lake Center. I wrote Truth and Science for two main reasons. First was to illustrate how the Light of Christ (Spirit of the Lord) blesses humanity with secular light and knowledge. Second, I wanted to draw comparisons between gospel doctrine and the assumptions underlying science. This latter aim is not apologetic in the sense of attempting to defend or prove the truth of LDS beliefs, rather in the book I discuss the extent to which scientific ideas and discoveries agree with fundamental truths found in the restored gospel. Please feel free to post comments about Truth and Science in the Religion & Science blog (click here). "KNOWLEDGE - throughout the ages it has been sought after by many. But it is only with the enlightening power of the Light of Christ that mankind continues to grow in knowledge both scientific and spiritual. From the dawn of time, God has given mankind the knowledge they need, without which mankind would have floundered in ignorance and been lost in darkness forever. 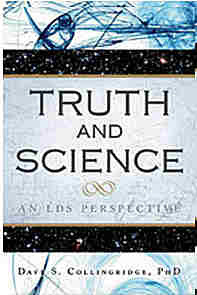 Truth and Science is an interpretation of historical facts, discoveries, and philosophies from an LDS perspective. This book takes a close look at scientific advances through history and compares them to corresponding spiritual advances. It also makes the case for the need for spiritual sensitivity when searching for scientific answers. With its careful mix of the spiritual and the secular, readers will find Truth and Science to be both informative and enlightening." Many scholars who lack an understanding and conviction of gospel principles worship at the altar of the god of science. With the book of philosophy and science as their bible, they think they have obtained lasting happiness and wisdom in their scholarly work. They are mistaken. The scriptures testify, "O the vainness and foolishness of men! When they are learned they think they are wise, and they harken not unto the counsel of God, for they set it aside, supposing they know of themselves, wherefore, their wisdom is follishness and it profiteth them not (2 Nephi 9:28) . Read the entire introduction and view the table of contents at cedarfort.com.